RIDGID Turbo Diamond Blades are made from Hi-Grade diamond powder with a proprietary bond engineered for maximum cutting performance. Use a turbo rim blade to achieve fast and smooth cutting. Turbo blades are designed to cut a wide range of masonry and construction materials. 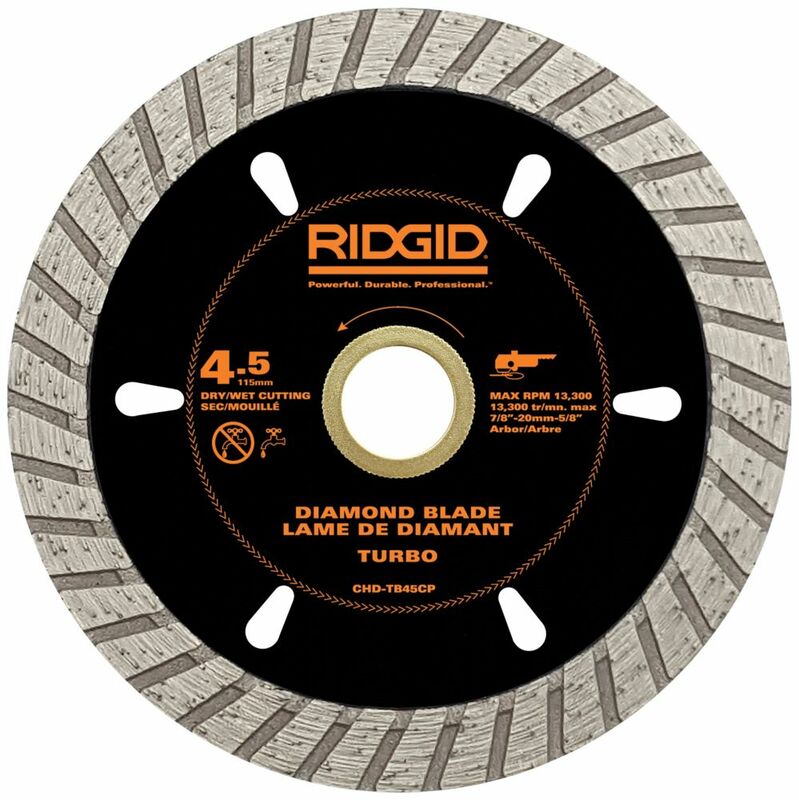 4.5 inch Turbo Diamond Blade RIDGID Turbo Diamond Blades are made from Hi-Grade diamond powder with a proprietary bond engineered for maximum cutting performance. Use a turbo rim blade to achieve fast and smooth cutting. Turbo blades are designed to cut a wide range of masonry and construction materials. 4.5 inch Turbo Diamond Blade is rated 4.1 out of 5 by 55. Rated 5 out of 5 by Richie from This blade ground the stone like butter.... This blade ground the stone like butter. Rated 1 out of 5 by ElectricJack from Easy to install but I was cutting superstruit with it and 1/2 way into the cut it starts spinning... Easy to install but I was cutting superstruit with it and 1/2 way into the cut it starts spinning on the drive axle.....Ryobi side grinder.... The product is way too flimsy.. Rated 1 out of 5 by HomeDepotCustomer from Too thick of a blade, only good for cutting cement... Too thick of a blade, only good for cutting cement board not tile. Surprised of the limited selection available. This was a waste of my money ! Times are changing people want quality more than ever this cheap equipment leads to unsatisfying results and angry customers. You used to sell good blades! Rated 5 out of 5 by HomeDepotCustomer from I used it a lot in the last couple days,... I used it a lot in the last couple days, and it take it to good, so far it works fine in hard work. We’ll see how far cutting we’ll is going. Rated 5 out of 5 by HomeDepotCustomer from Works good . ... Works good . Rated 5 out of 5 by BigKDawgSC from Blade cut through rock fireplace surround with ease...very pricey but... Blade cut through rock fireplace surround with ease...very pricey but got the job done quickly.